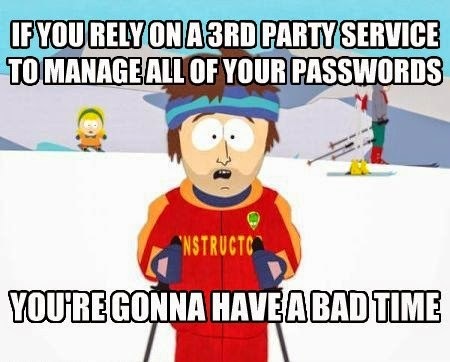 Apparently LastPass users got a painful lesson in single points of failure. It's bad enough when a music or video game DRM server goes down, but when your password management site goes down you're locked out of everything. yeah, i thought that too, and yet read the article. users were locked out, the site was timing out, the browser plugins were unresponsive, and users couldn't access their credentials. whatever offline capability lastpass has is clearly not good enough. that's great, good for you. that's not what other people experienced. they experience unresponsive plugins - meaning they were unusable, not just that they couldn't connect. of course, not everyone had that experience. the article didn't say ALL lastpass users were locked out of their accounts, only that many of them were, so the effects were not uniform across the entire user population and you apparently lucked out.